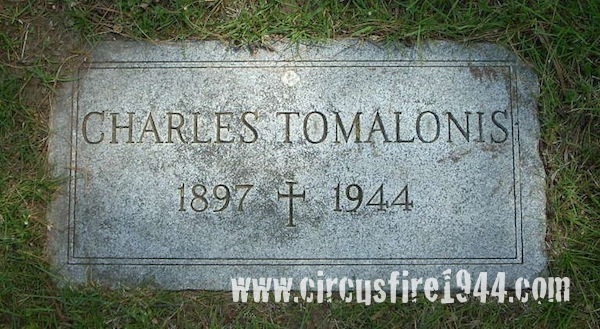 Charles Tomalonis of 24 Lawrence Street, Hartford, was born February 15, 1897 in Lithuania. He was found seriously injured at the circus grounds after the fire on July 6, and was taken to Municipal Hospital where, despite supportive treatment, he died during the evening of July 11. Charles attended the circus with Mrs. Katherine Vensas and her granddaughter, Valerie Nogas, both of whom also lost their lives in the fire. He was buried at Mt. St. Benedict Cemetery in Bloomfield after services at Dillon’s Funeral Home on July 13. The estate of Charles Tomalonis was awarded $6,650 by the arbitration board. Charles, a tobacco farm worker for Imperial Agricultural Corp., was a boarder in the home of Mrs. Katherine Vensas, and in 1935 he bequeathed his entire estate to her. 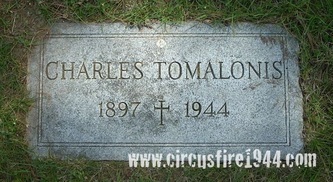 Mrs. Vensas, however, was also a victim of the circus fire, which left Mr. Tomalonis with no known heirs. After a mandatory ten year waiting period, his estate (then valued at $7,775.34) was closed in 1958 and the money was turned over to the State of Connecticut.